Discussion in 'Intel x86 CPUs and chipsets' started by windwithme, Dec 19, 2012. 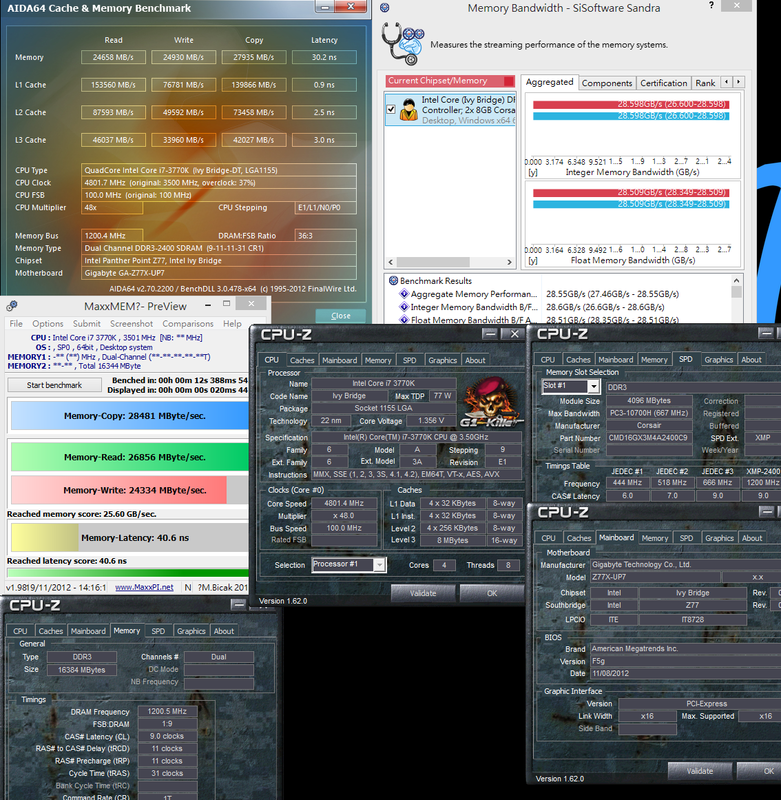 2012 is very important for PC market. There are more and more mobile devices coming. Especially smart phones and tablet PCs. It really impacts traditional PC and NB markets. This change does benefit the users which you can see the change in MB market. More brands start to enhance their service terms and conditions. 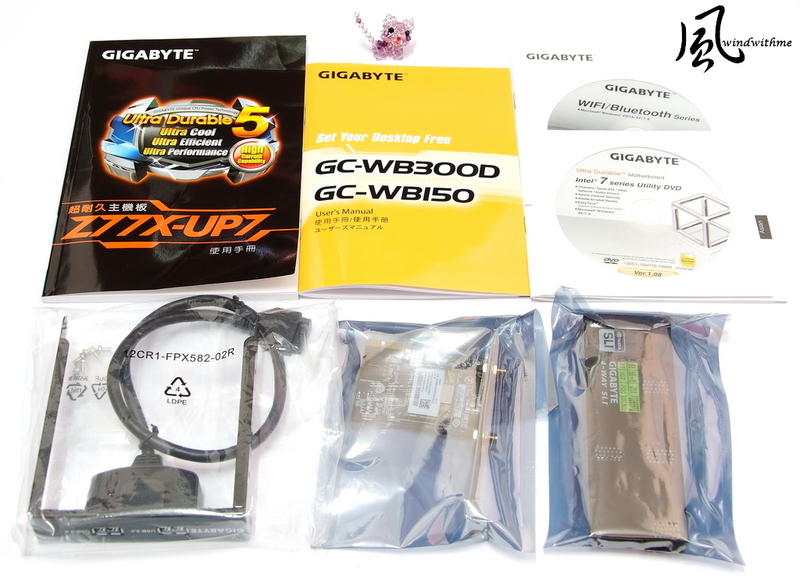 GIGABYTE also launched their 4 years warranty in Taiwan. 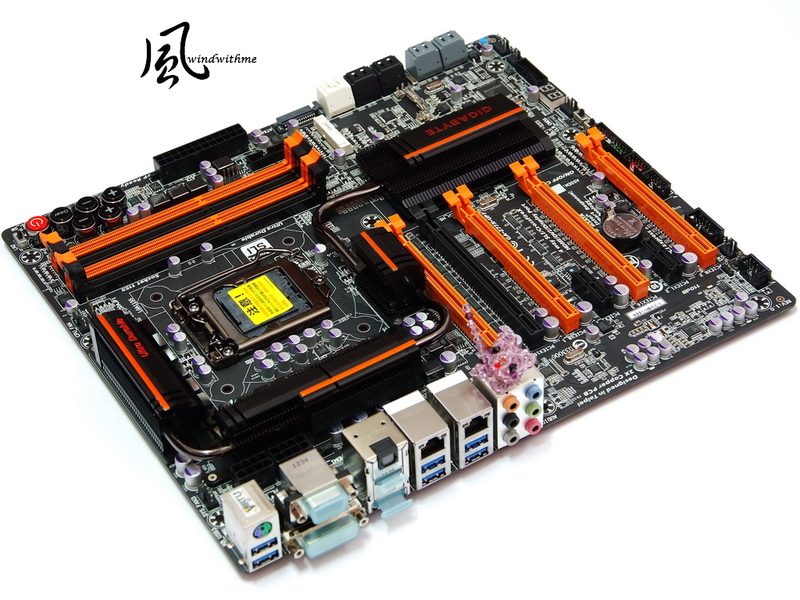 For mid to high end Intel Z77 platform, the price drops from former 170UD to 120USD. High end Z77 price is around 10~15% lower than previous chipset. Except the MB enthusiasts market, the price drop is good for general users. 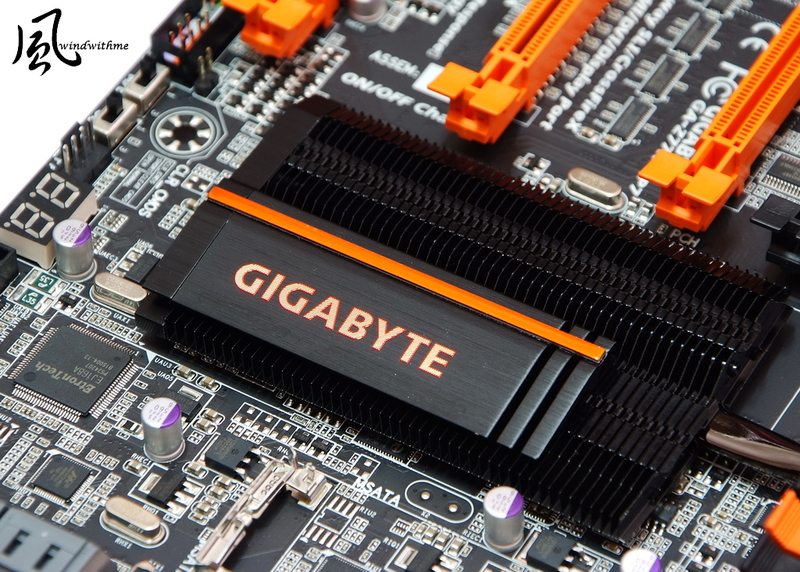 GIGABYTE high end MB has 2 product lines. One is Gaming series, Z77 model called G1.SNIPER3. 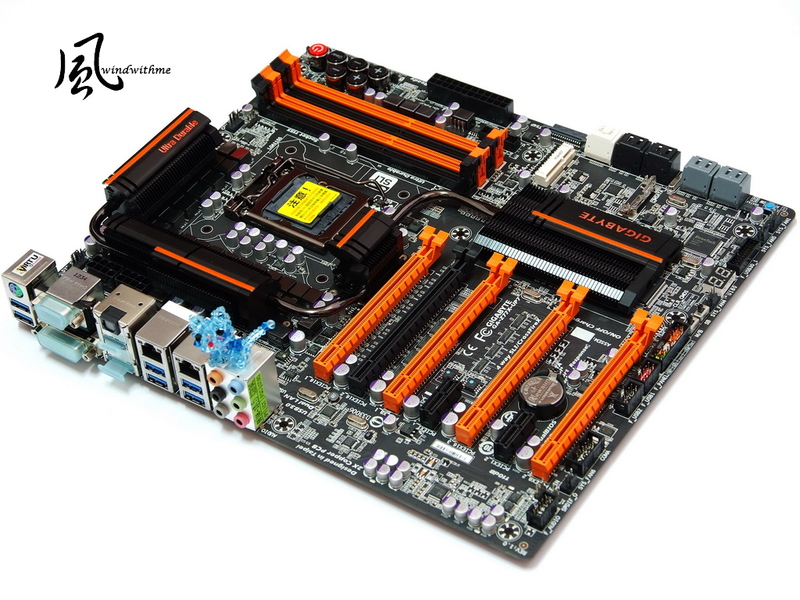 The other one is designing for OC and extreme performance, the board for this review, called Z77X-UP7. 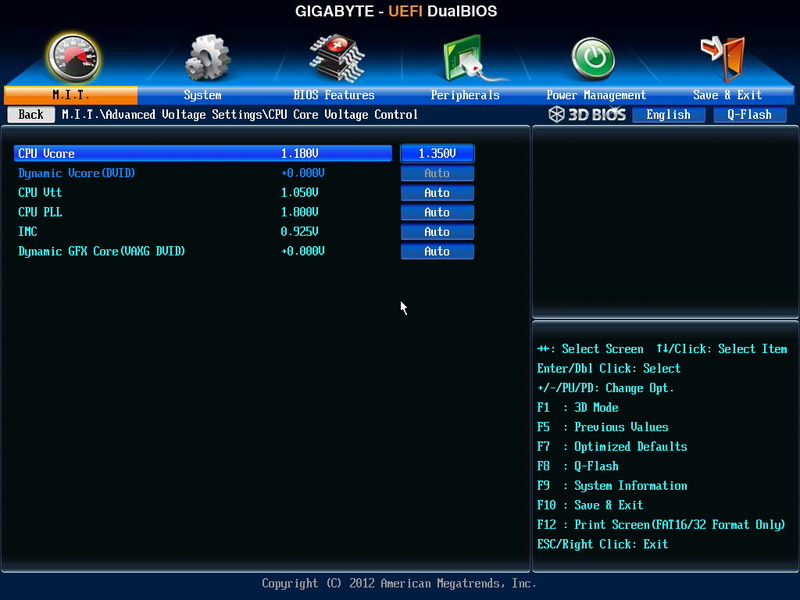 GIGABYTE used to use UD with numbers as model name. This model changes to UP with number. First, you can see the Z77X-UP7 board. The color is black and orange which is different with past UD7. Z77X-UP7 is E-ATX, size is 30.5cm x 26.4cm. Most ATX case can install it, except shrinking ATX case. It?s for Overclocking market. The following part will introduce all the details. Product Manual, software manual and drivers CD. 3.5? front panel controller board, BT4.0/WiFi card, 4-Way SLI bridge. IO panel, back panel SATA bracket, SATA cables, WiFi antenna. CrossFireX / 2-Way and 3-Way SLI bride, voltage cables. 3 X PCI-E X16 support X16 bandwidth. 2 X PCI-E X16 support X8 bandwidth. It supports up to 4-Way AMD CrossFireX/nVIDIA SLI technology. LAN chips are Atheros GbE and Intel GbE LAN. It builds in Realtek ALC898 audio chip supporting 7.1 channel and High Definition Audio technology. 2 X White SATA by Z77 support SATA3. 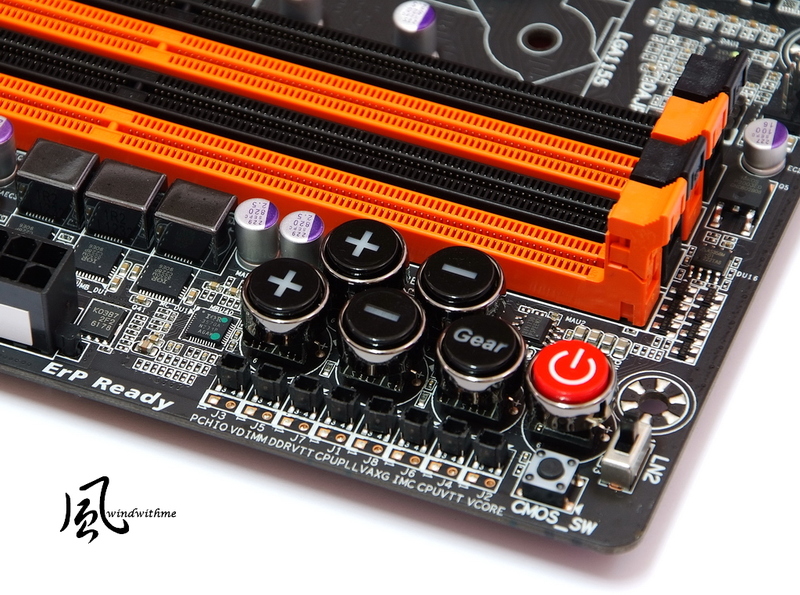 4 X Black SATA by Z77 support SATA2. It supports hybrid RAID 0, RAID 1, RAID 5 and RAID 10. 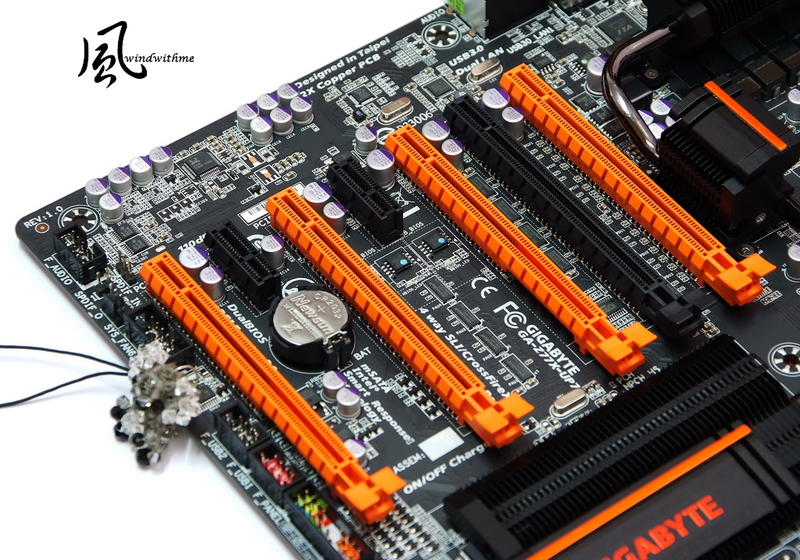 The max performance decides by installed SATA devices. 4 X Gray SATA by Marvell 88SE9172 support SATA3, RAID 0 and RAID 1. 1 X mSATA supports SATA2. If you install mSATA, SATA2 port 5 will not work. Right hand side is debug LED, MB and SB are dual BIOS switcher, and blue round button is RST_SW. 4 X DIMM DDR3 support 1066/1333/1600/2666(OC) and DDR3 max capacity is 32GB. It supports Extreme Memory Profile technology. Next is 24-PIN power connector and front USB 3.0 connector. Z77X-UP7uses new fins design with heat pipe. CPU metal cover is better quality by plating process. 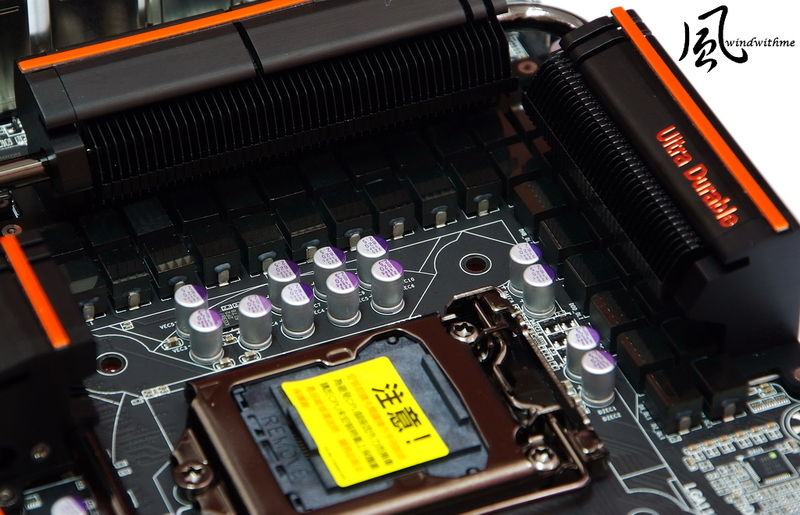 Behind the heat pipe, there are 2 8-pin power connectors for high power consumption usage after OC. Z77 high end version also use big surface heatsink. It looks elegant. It features ultra-thin metal fins, the heatsink provides greater surface area so that quicker heat exchange can occur. Z77X-UP7 this design is better than Z68X-UD7. Red button is power button. Two + and ? for adjusting CPU and BCLK. Gear is for BCLK steps switch. Right hand side is LN2 switch and below has 8 touch points for voltage measurement. GIGABYTE displayed IR3550 PowlRstage in ComputeX 2012. This new PWM design uses in own mid to high end MBs. 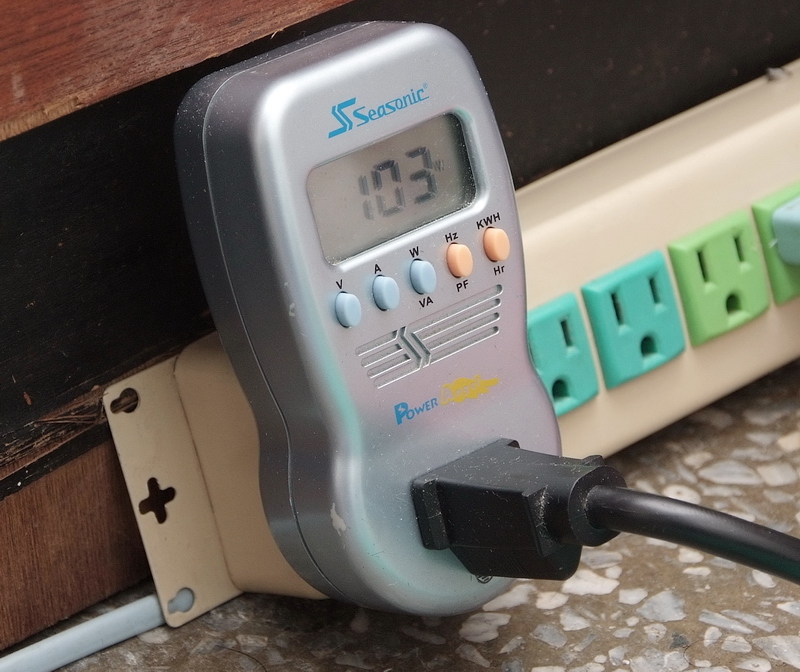 It delivers 60A per phase and lower temperature than former PWM design. Z77X-UP7 uses 37-phase digital PWM, 32-phase CPU + 2-phase VTT + 3-phase Intel HD GPU. 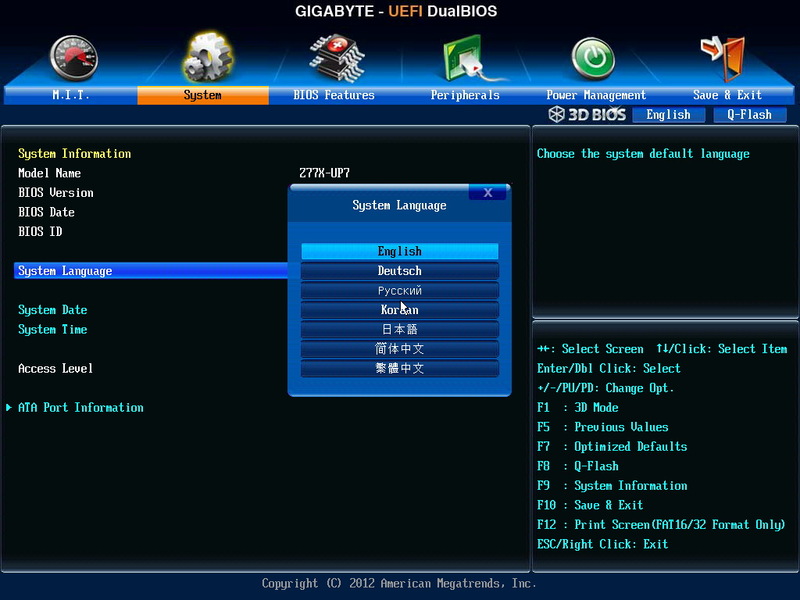 GIGABYTE UEFI interface provides 7 languages. I remember it seems didn?t support Korean in previous version. Intel Core i7-3770K default ratio is 35. I set it as 48 to run at 4800MHz. Enable X.M.P. and this CORSAIR DDR3 auto set to 2400 and CL. Vcore Loadline Calibration is important feature for CPU OC. CPU voltage set as 1.350V and Vcore Loadline Calibration is default. When CPU is full speed, voltage will drop around 2 levels. 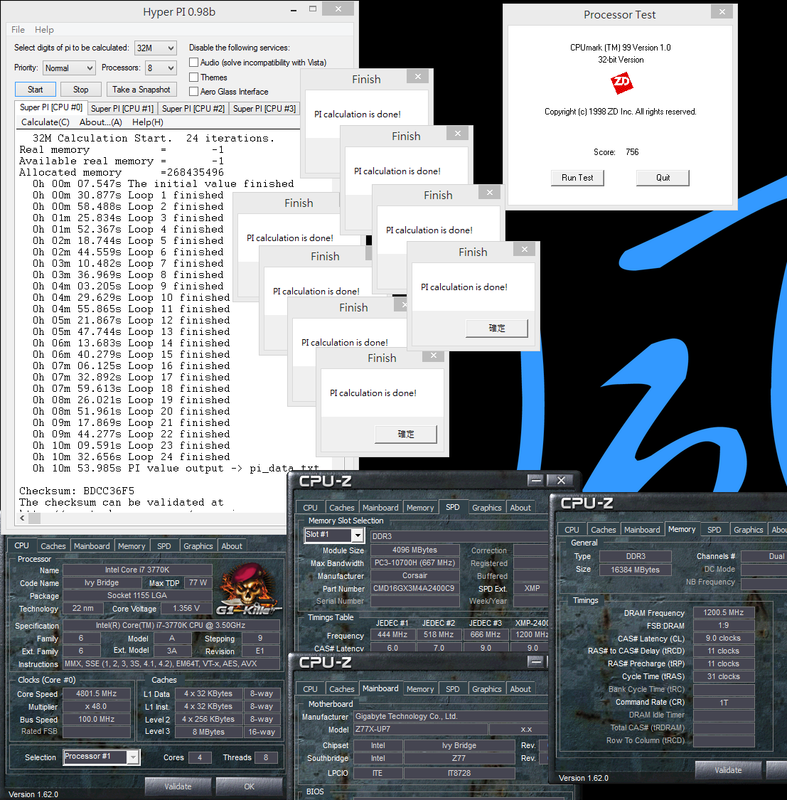 As the pic, I switch to Extreme and set CPU to 1.350V. It?s 1.356V as standby and 1.368V as full speed. 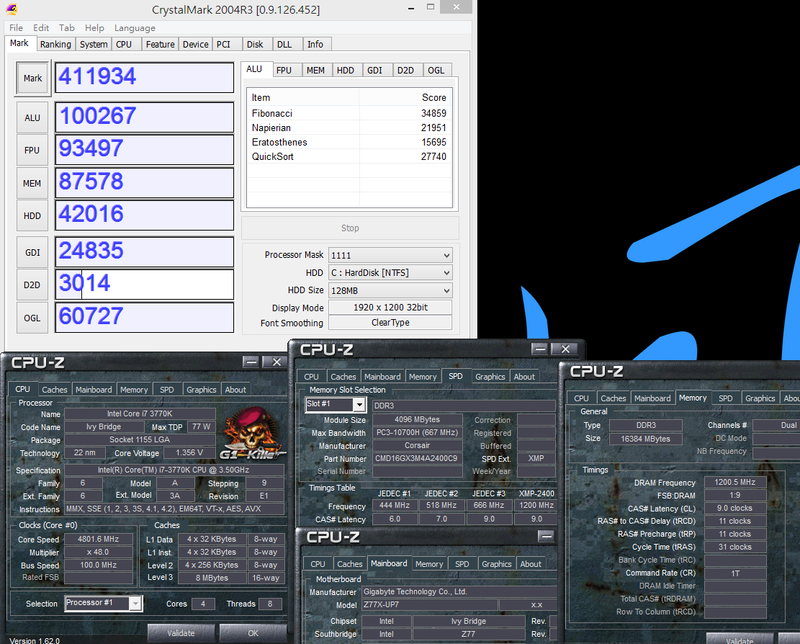 I set i7-3700K to 1.350V. It can pass all software stalely. DDR3 voltage is 1.650V as the other key voltage in OC. This is my first time using Windows8 for product review. Hyper PI 32M is 30~40 sec faster and the other software also improved more or less. 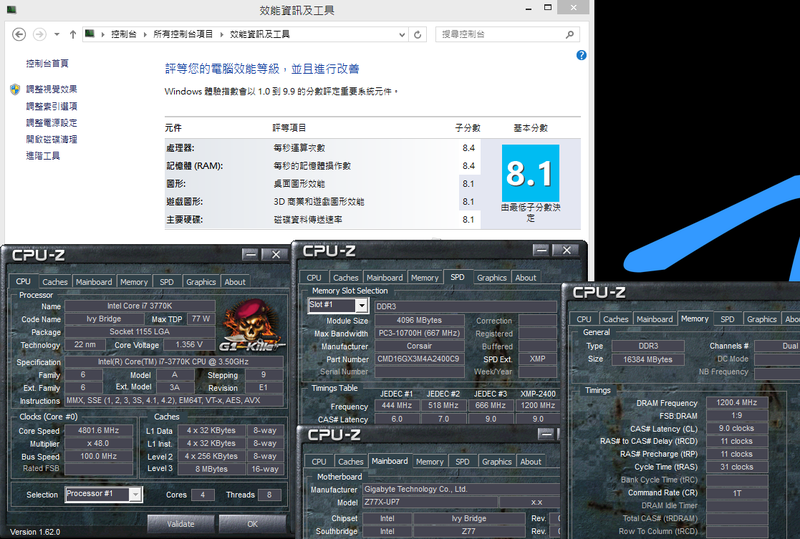 The special part is Windows8 experience index break through the CPU 7.8 limitation in WIN7. Also, Windows8 installed capacity is 10GB less than Windwos7. It?s a little faster than WIN7 in booting. Booting screen is similar with tablet or smart phone, touch panel devices. After entering main screen, the interface is almost same as Windows7. However, there are some new features. As general users, it takes time to get used to the new interface. 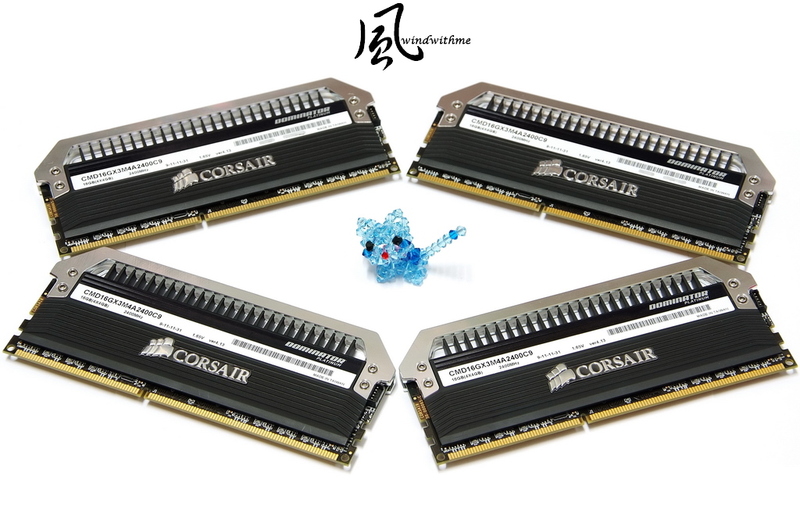 DDR3 is USA CORSAIR Dominator Platinum series, CMD16GX3M4A2400C9. The packing is very unique. It?s a 2 layers stack. Each layer consists of 4GB X 2. 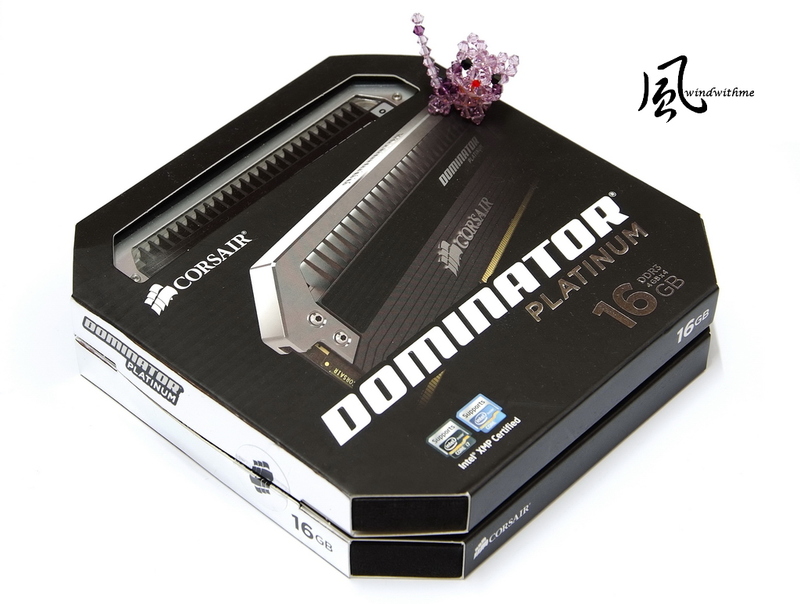 Dominator Platinum is CORSAIR most high end DDR3 product line. 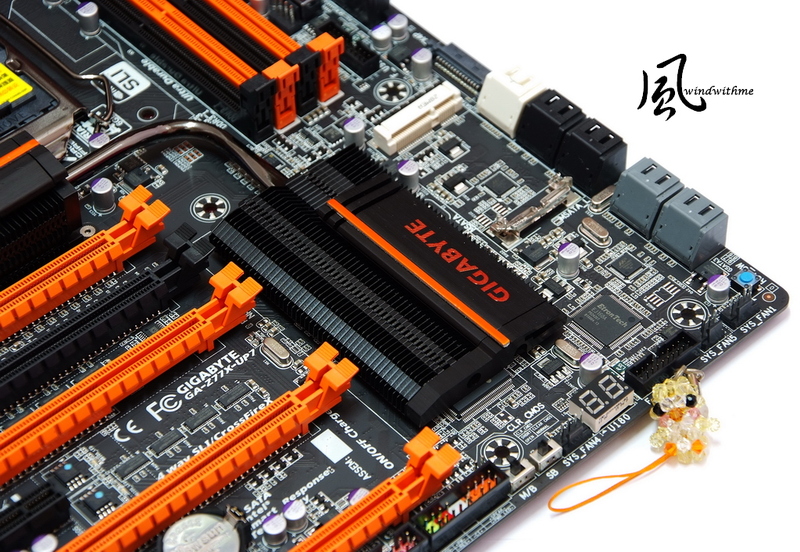 The heatsink quality and design are even better than Dominator GT series. The picture is DDR3 2400 4GB X 4. 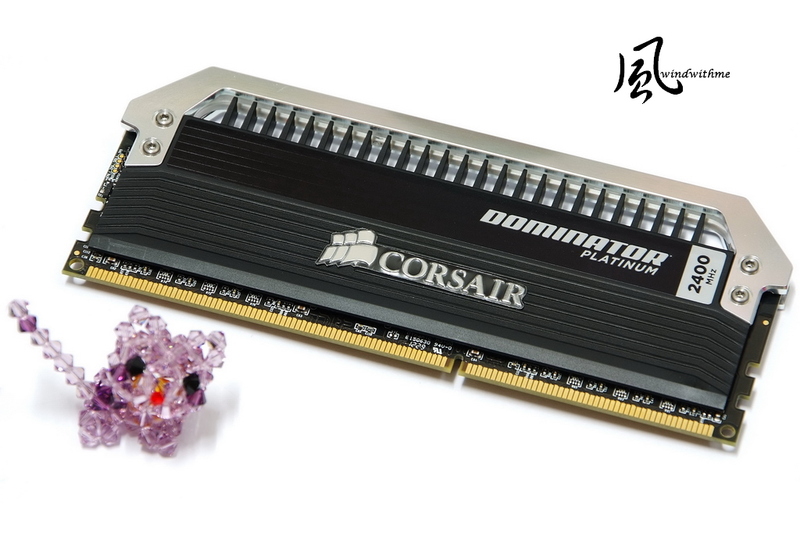 The internet shows Dominator Platinum has launched DDR3 2800. 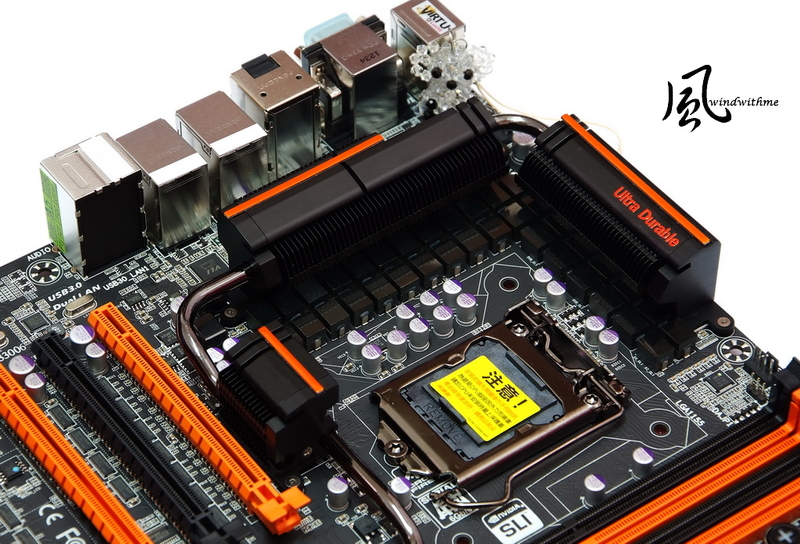 DDR3 top with white metal heatsink. I guess it?s the reason for naming Platinum. It bundles with CORSAIR original DHX(Dual-path Heat eXchange) Cooling technology with better cooling ability. After power on, the top of black heatsink will light blue-white. It makes quality even better. The test is running at DDR3 2400 1T and 4G X 4. 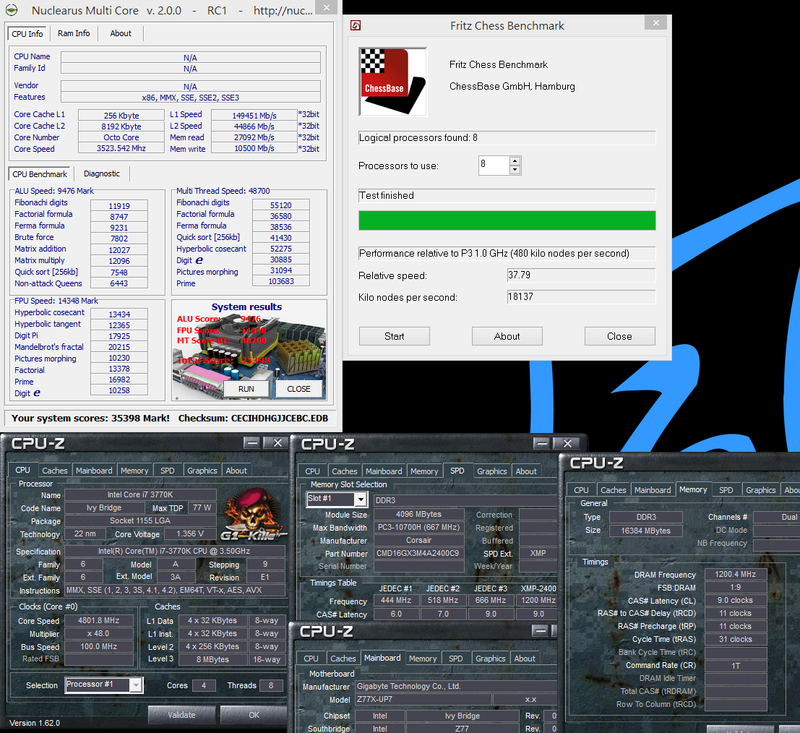 Z77X-UP7 4DIMM OC ability is quite good. The gap is not big between 2 and 4DIMM. 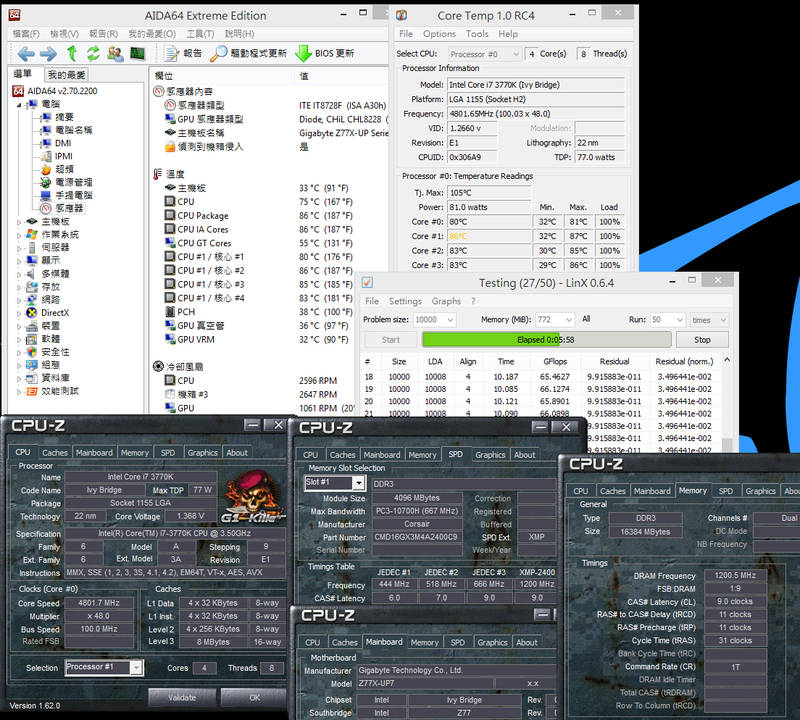 After comparing three DDR3 clock, you can see the bandwidth is rising gradually from DDR3 2400 to 2666. Even though Ivy Bridge structure bandwidth increasing range is not big, the extreme clock has improved a lot from Sandy Bridge. 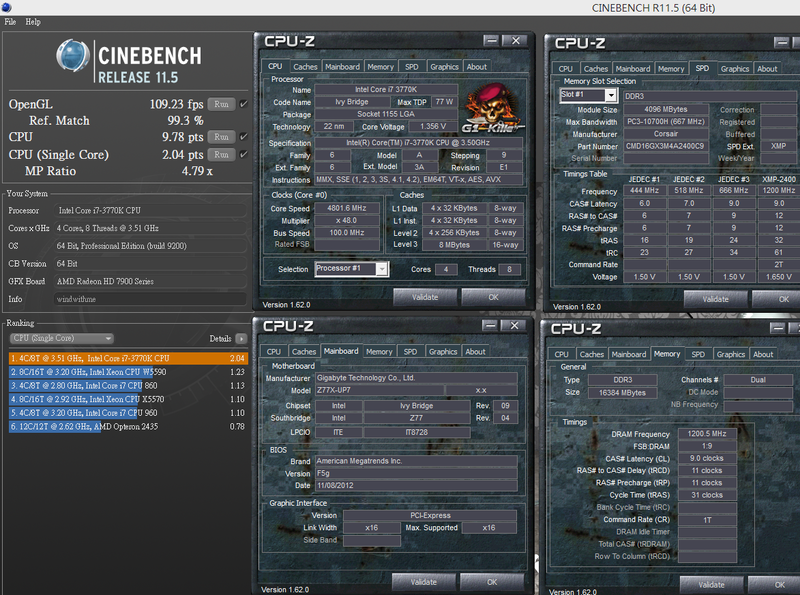 As DDR3 OC, I think it?s more about memory quality, voltage, and CL tuning. It takes time to find out the best CL and clock. 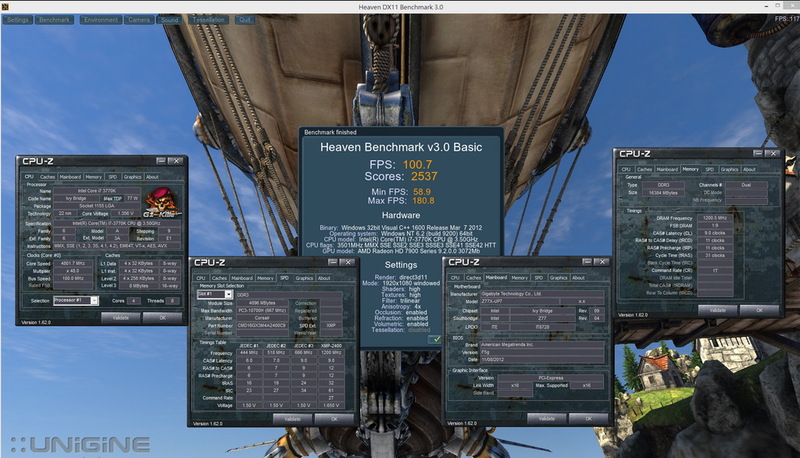 When running with VGA - AMD Redaon 7970, the 3D performance is very high. Unfortunately, I only got one7970 card. As single card performance, Z77X-UP7 is above standard. You can see 3~5% difference in 3D performance. It may be caused by Windows8 or latest AMD driver. 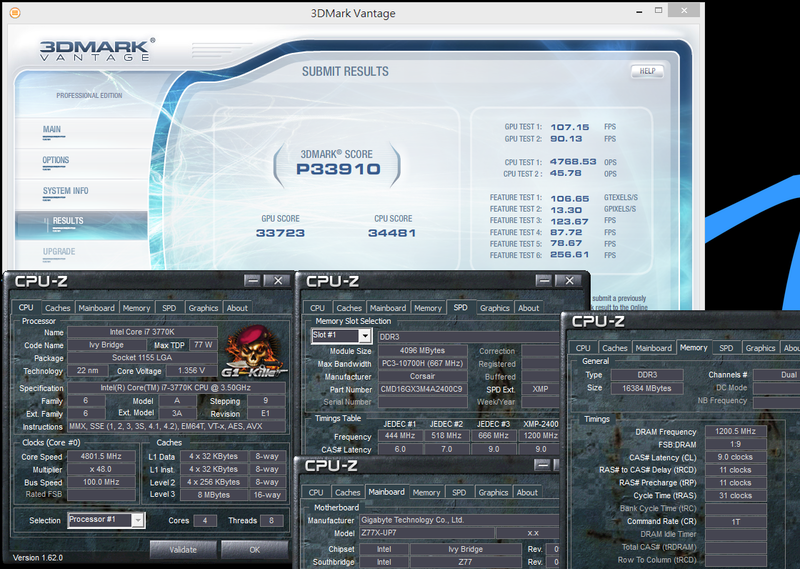 If there is any opportunity in the future, I will test 3DMark Vantage to see the detail 3D performance. 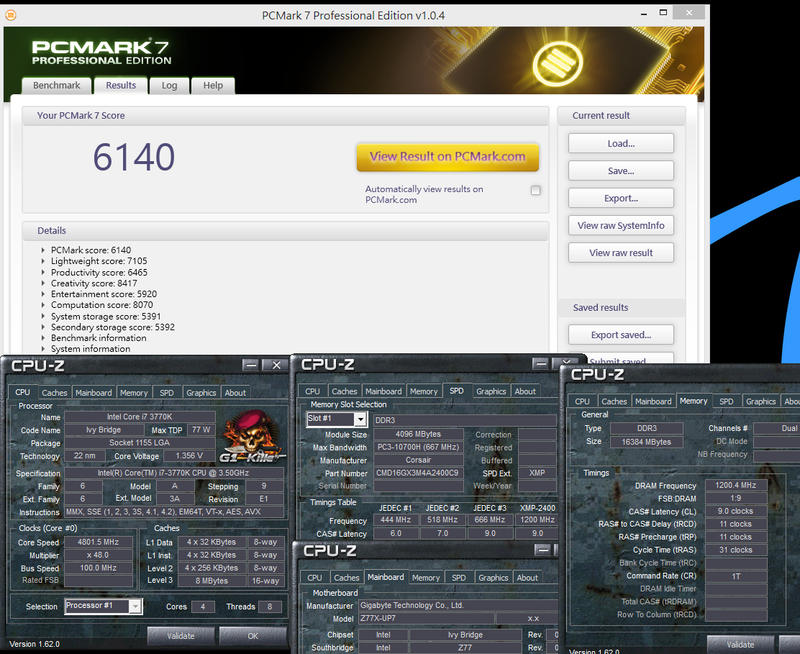 i7-3770K disable C1E, OC to 4.8GHz and combo with AMD HD7970 VGA. The platform uses none 80Plus 600W Power Supply to compare the power consumption status. When entering to OS desktop, you can see the power consumption is very low. 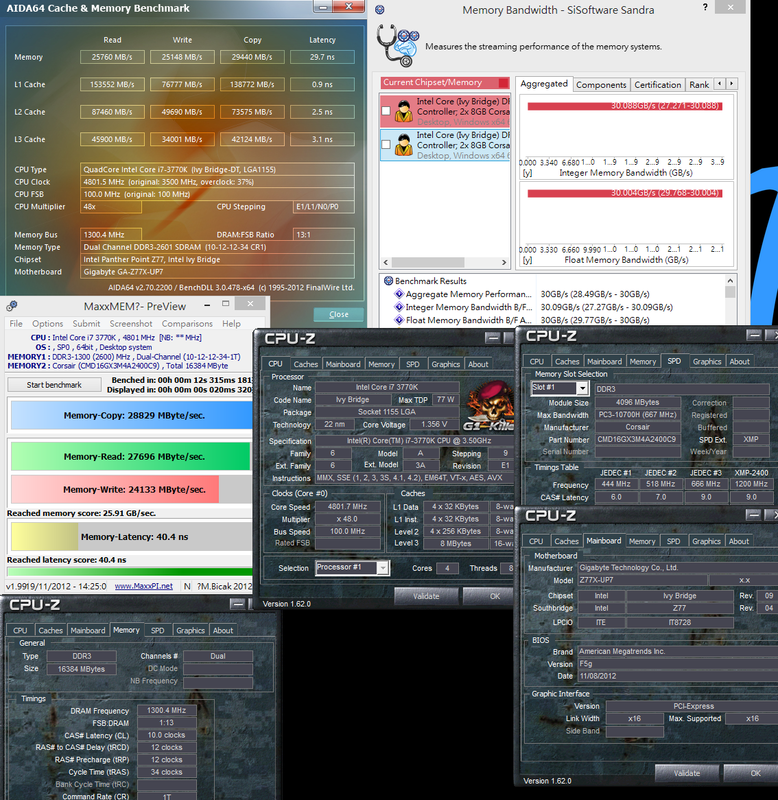 When CPU or GPU full speed, the power consumption increases a lot. You can see even Z77X-UP7 is 32-phase CPU PWM, it doesn?t cause any extra loading. 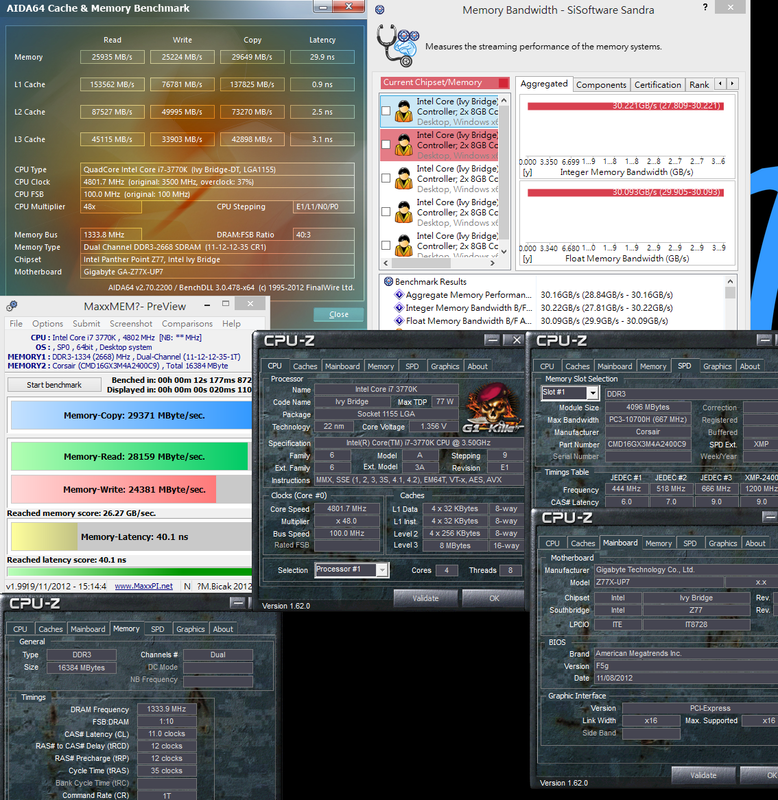 When i7-3770K OC to 4.8GHz, I suggest you to use high end fan or water cooler. If it?s winter, the temperature will be a little bit lower. Under this temperature condition, if you are installing in chassis, the inner air flow will be very important. At same room temperature, I test the MOSFET temperature. 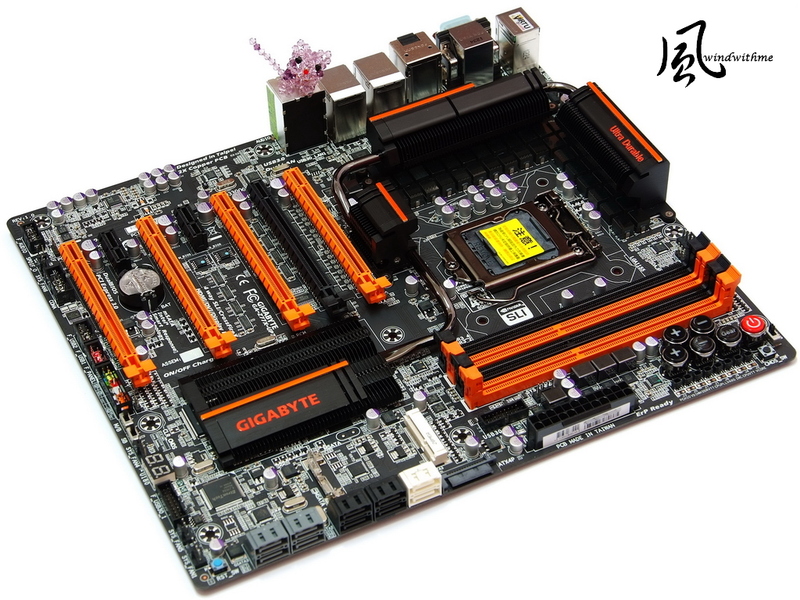 GIGABYTE launched IR3550 PowlRstage in Computex 2012 as own high end MB new PWM design. When disabling C1E and entering to OS desktop, it?s about 35.7. When burning system, the max is around 46.7. The temperature is very low. I will compare it with other Z77 MOSFET in the future. 1.UP7 owns more OC designs and better hardware specs, comparing to UD7. 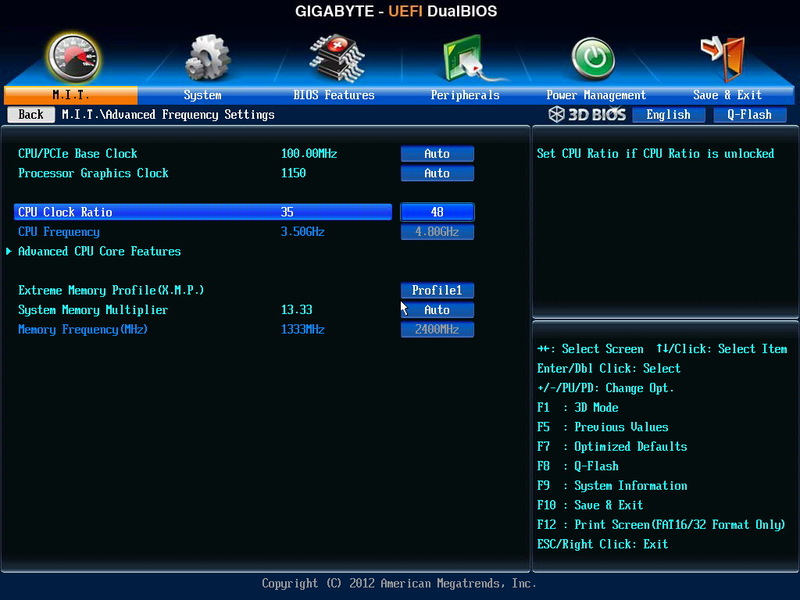 2.UEFI BIOS has two interfaces for users to choose. 3.Exclusive OC-Touch design and 32-phase CPU digital PWM enhance the OC capability. 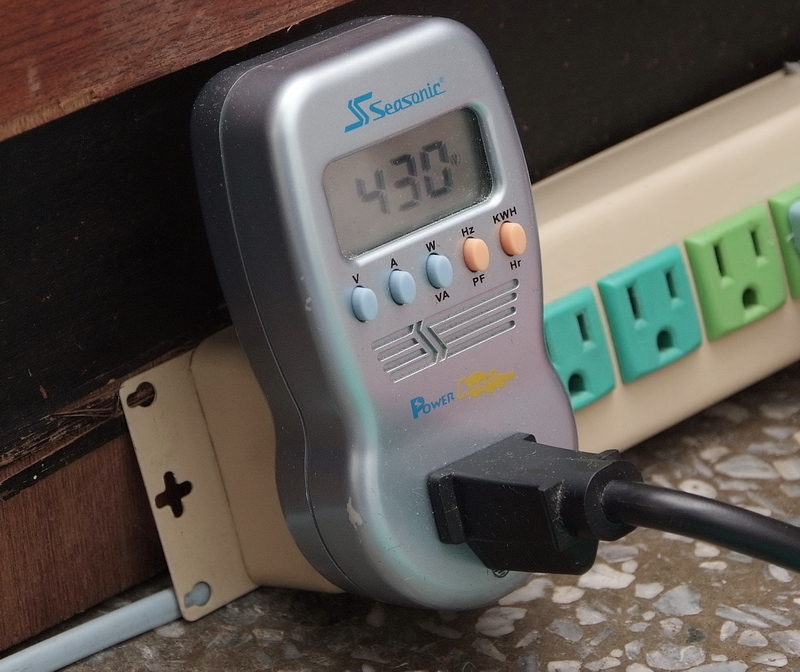 4.Using IR3550 PowlRstage latest PWM design to lower the MOSFET temperature. 5.Unique BT4.0 / Wi ? Fi card to connect your all mobile devices. 6.Supporting max 4-Way AMD CrossFireX/nVIDIA SLI technology. 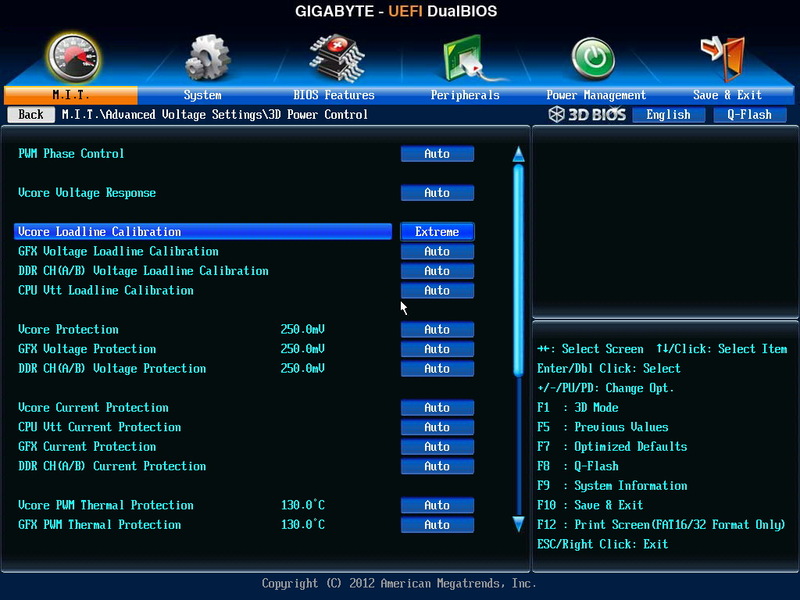 1.CPU voltage in full speed or standby is not stable in default setting. 2.DDR3 bandwidth can be improved. 3.Should use better audio chip. 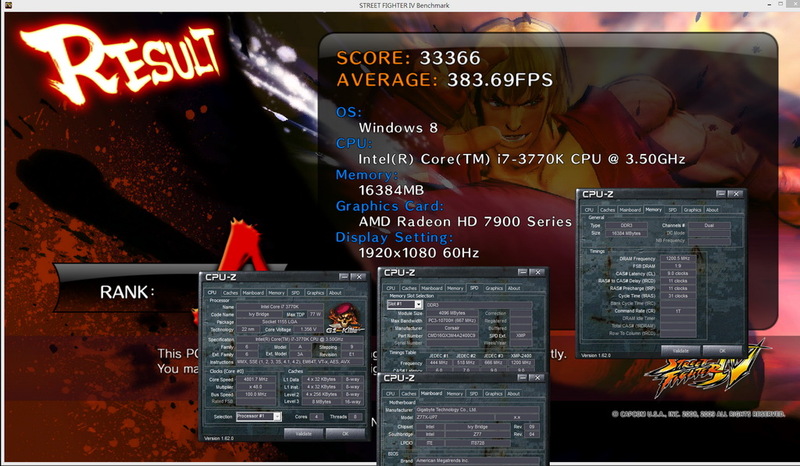 Z77X-UP7 is improved a lot in both hardware and software comparing to Z68X-UD7. 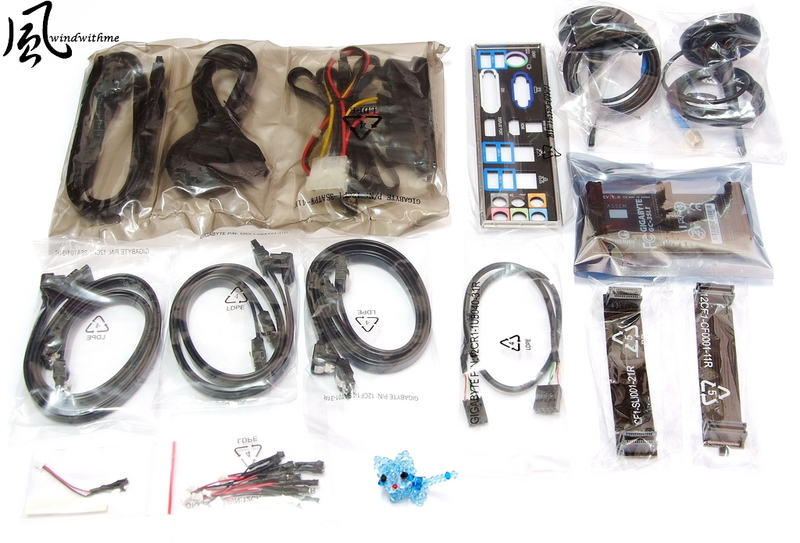 For example, new IR3550 PowlRstage PWMa and 32-phase digital CPU PWM. It supports max to 4-Way AMD CrossFireX/nVIDIA SLI and exclusive BT4.0 / Wi-Fi card. OC-Touch OC design is for users to OC in bare system and extreme OC. The color changes to black with orange which is more eye catching. 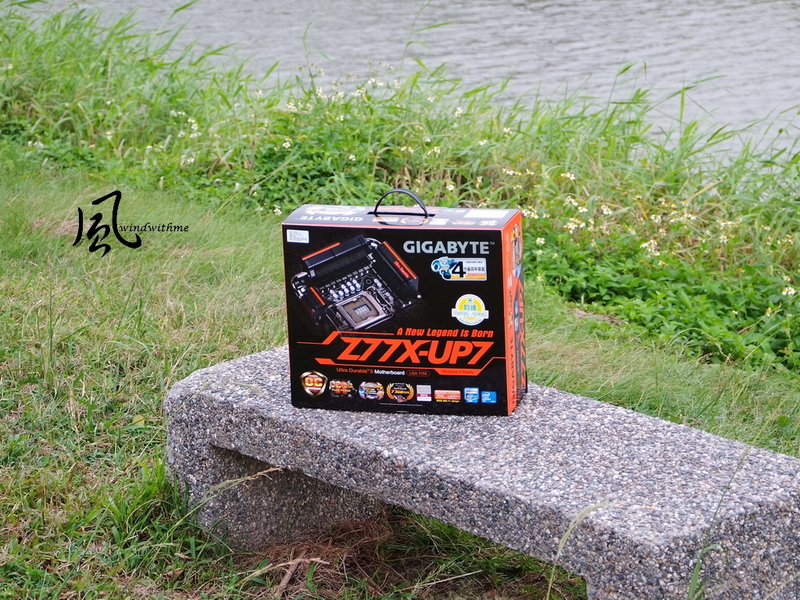 Z77X-UP7 is one of GIGABYTE most high end model in Z77. It uses own most high end components and specs in 2012. As it?s a top model, the price is also high in Z77 MB. As the top MB product, C/P value is always low. It?s suitable for higher budget and top specs demanders. 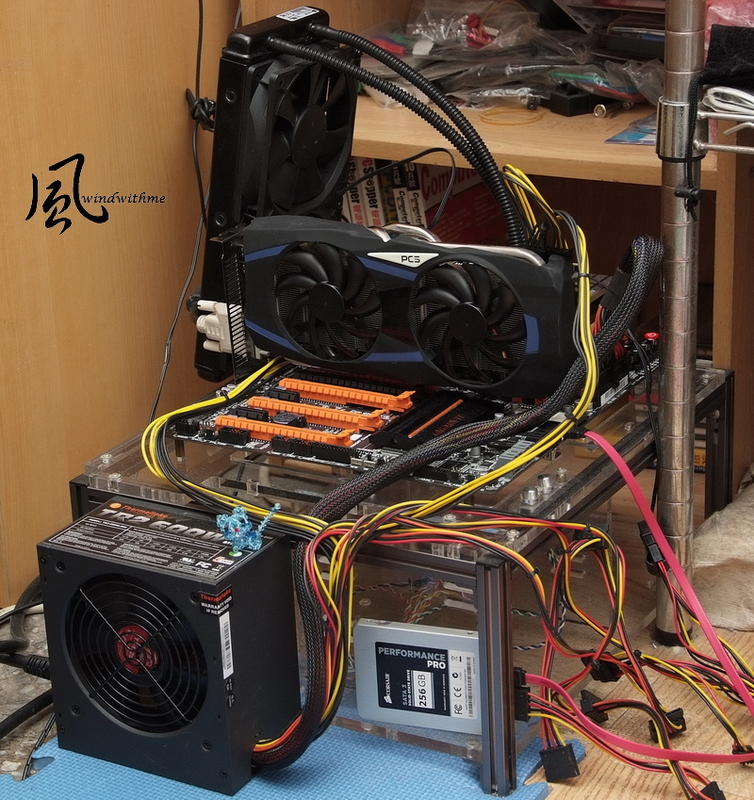 Recently, windwithme shared GIGABYTE Z77X-UP7 and ASUS Maximus V Extreme, top 2 brands high end Z77. Mainly, I only do air cooling OC or some performance tuning. I hope it’s useful for your reference. This is also post in my blog - WIND3C, All comments are welcome.